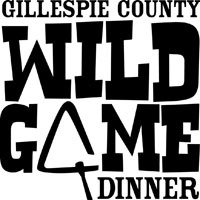 Mark your calendar for one of the greatest wildlife event Gillespie County offers, the 2018 Gillespie County Wild Game Dinner! Join us for the 2018 Gillespie County Wild Game Dinner on November 17th, 2018 at the Gillespie County Fairgrounds in Fredericksburg, TX. Come support youth and adult agricultural education in the Texas Hill Country. Enjoy our Live Auction, Silent Auction, Prize Giveaways and much more. Dinner & drinks kick off at 5:30 p.m. Pick up tickets for this event at Lochte Feed in Fredericksburg starting November 1, 2018. Tickets are $25 each. If you would like to be a donor or sponsor for the event, please contact [email protected] Support agriculture in our local community! This entry was posted on Sunday, September 16th, 2018 at 11:53 pm	and is filed under Events, News & Updates. You can follow any responses to this entry through the RSS 2.0 feed. Both comments and pings are currently closed.